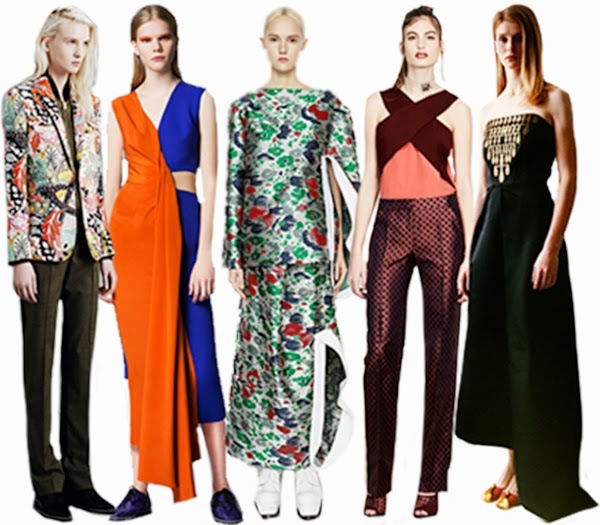 Designers are often inspired by different locations and cultures, but Pre-Fall seems to be all about Asia. Graphic floral prints and rich silks in saturated shades have found their way onto jackets, pants, and dresses, as designers found inspiration in porcelain designs and traditional Japanese paintings. Roksanda Ilincic's orange and blue outfit drew on the robes of Buddhist monks as well as the modernized architectural style of futuristic-looking cities like Shanghai and Seoul. Designers placed a special emphasis on drapery and form this season, with many outfits echoing artfully-arranged saris from India. Though rooted in traditional dress and artistic style, the eastern-inspired clothes of Pre-Fall 2014 are as modern as the cities in Asia; thoroughly 21st century clothes. I love the two facets of this style - on the one hand, you have fabulously intricate patterning; on the other, simple (but still luxurious) fabrics elegantly draped - and how they vary rather differently but come together to create beautiful clothing.